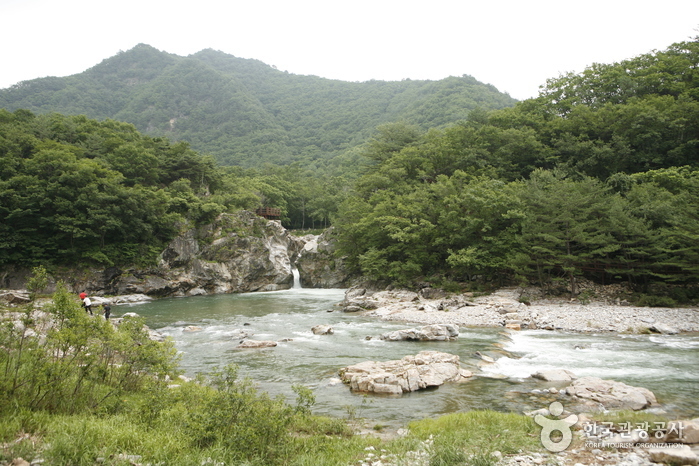 Dutayeon Valley is located in the tributary of the Gunsori Incheon, Bansan-myeon, the northern part of the civilian access control line. Although there is not a lot of water flow, it forms a beautiful scenery of surrounding mountains, and it is not polluted, and it is known as the biggest habitat of livestock as a natural monument. A 10-meter-high, 60-meter-wide valley falls in one place, and the rumble vibrates the heavens and fogs the mist at midnight. Just below this waterfall is a 20-meter-long rocky screen, and the eastern rock has a 3-pyeong oyster, with a hair comb and horsetail on the bottom. It is a name derived from the fact that there was a temple of Duta Sarang a thousand years ago.